After posting the swatch and review of the Summer 2016 Viva Antigua Collection, you guys gave me a ton of requests for comparison polishes on Instagram! Thanks so much for your input. I took all of your suggestions and if I had the polish I compared it. I also held up the polishes to my Essie collection wall and pulled out a few more that I thought looked super close. I surprisingly didn't find as many dupes as I expected to, but at least half were incredibly close. Let me show you! I used 3 coats for all. Coconut Cove is very very subtly a warmer white compared to the cool stark white of Blanc and Private Weekend, but it's not enough where they look different. I honestly couldn't tell them apart once they were on my nails. I still had the slight ridging of Coconut Cove that I mentioned in my swatch and review post and it seems to get worse with each coat you add. While Private Weekend, Coconut Cove and Blanc all looked similar on my nails, Marshmallow looked quite a bit different because it's not an opaque polish. In my opinion, if you have Private Weekend or Blanc I really don't think you need Coconut Cove as well. In this comparison, I did 3 coats for all except Coconut Cove. I applied Coconut Cove with a thicker 2nd coat so I could float the polish over the nail and I avoided ridging that way. 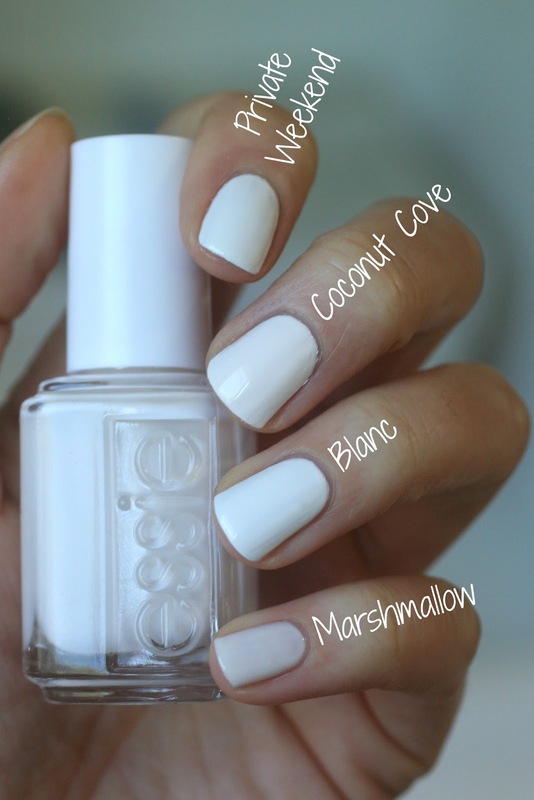 As far as colours go, Baby's Breath is the closest but Coconut Cove is still a brighter shade of white. Between the Seats from the new Wedding Collection (swatches coming later this week!) is quite a bit more beige, as is Limo-Scene. As soon as I saw Berried Treasure I thought "I totally have at least 4 other bottles of that colour!" Surprisingly, I don't have anything exactly like it. Peach Daiquiri is a similar shade of pink as Berried Treasure but it's slightly lighter. Berried Treasure is a bit more saturated and deeper in tone. Brides No Grooms has the same saturation of colour as Berried Treasure but it's a cooler pink while Berried Treasure is warmer. 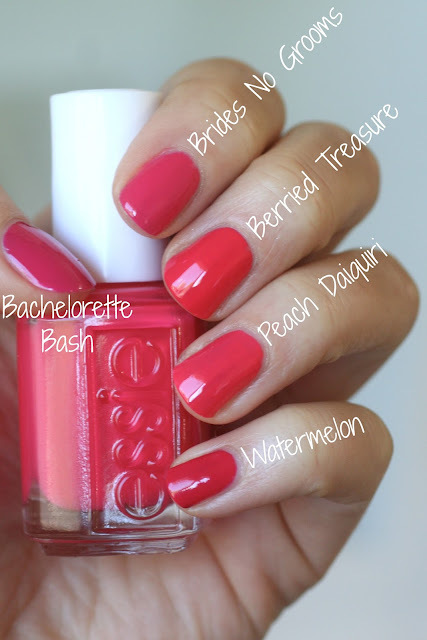 Watermelon is deeper in colour and Bachelorette Bash is deeper still with a touch of purple. I used 2 coats of all these polishes, but seeing it up close, I should have done a third coat for Peach Daiquiri and Berried Treasure. Ugh. These reds are the hardest for me to photograph. My camera seems to only see one shade of red, which makes it super hard to show you the differences! I'll tell you upfront that the only two that look similar in real life are Hiking Heels and Color Binge. I almost wanted to call them dupes, but they are ever so slightly different. Color Binge is slightly brighter than Hiking Heels and Hiking Heels may have just the teeniest bit more red in it, but the differences are so miniscule. You definitely do not need both. While Meet Me at Sunset looks the same as Hiking Heels in this pic, it's really not. It's much more orange and has a dusty quality. Sunshine State of Mind is a much brighter and lighter orange than all of them. There's 2 coats of all the polishes. This pic is more accurate than the last one. Come Here and Sunset Sneaks are obviously lighter, brighter and more pink than Hiking Heels. BUT, Fifth Avenue is a dead on dupe! It looks EXACTLY the same as Hiking Heels in person and in the photo and it also applied the same. All of these polishes have 2 coats. I really liked Tribal Text-Styles from this collection because I knew I had nothing quite like it in my Essie collection. The shimmer in this polish is so densely packed and noticeable. I don't use bright artificial light to take my pictures which can really highlight the shimmer if it's in a polish. Instead I use the natural sunlight that comes in through the windows so that it shows the polish in it's most natural looking state. In this photo, Tribal Text-Styles is the only one where the shimmer is obvious, whereas Haute Tub, Frock 'n' Roll and Cashmere Bathrobe you are left straining to see the shimmer since it's more sparse and subtle. As I polished, I was thinking Over the Edge would have a similar base colour as Tribal Text-Styles, but it's actually more gunmetal grey and looks closer to Cashmere Bathrobe. They have quite different formulas though. Cashmere Bathrobe is a creme polish with silver glitter in it, while Over the Edge is made up of teeny tiny shimmer, kind of like car paint. Still nothing that looks quite like Tribal Text-Styles. Nothing quite the same here either. Viva Antigua is quite bright and shimmery compared to the others. Garden Variety is totally different and much more blue-toned and Naughty Nautical and Melody Maker are a deeper shade of green compared to Viva Antigua. Naughty Nautical's shimmer is hardly noticeable where you definitely see Viva Antigua's. This grouping of polishes is even more different. Where's My Chauffeur looks similar in the photo but in real life it's paler, dustier and leans a bit more blue in tone. 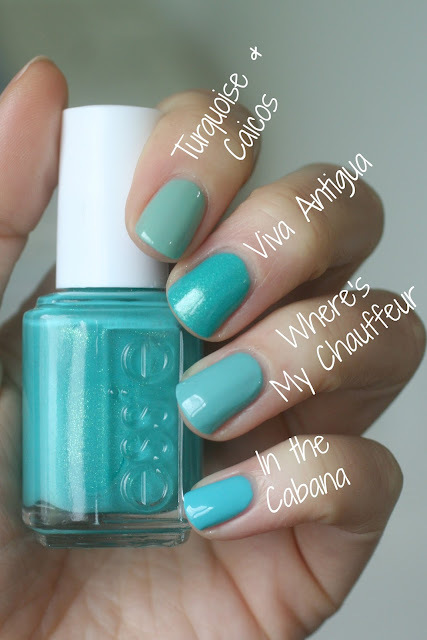 In the Cabana is way more blue and Turquoise & Caicos is a dustier green. Of course none of these polishes would look exactly like Loot the Booty because of it's turquoise shimmer, but the comparison here is more to see the shade of blue that Loot the Booty is. It's closest to Bouncer It's Me (which has a terrible formula by the way!) but it's not exact. It's a deeper sapphire blue than Bouncer It's Me, Mesmerized or Butler Please. Starry Starry Night is a much deeper shade of midnight blue than Loot the Booty with bigger pieces of glitter. Loot the Booty's shimmer is much finer and more dense. 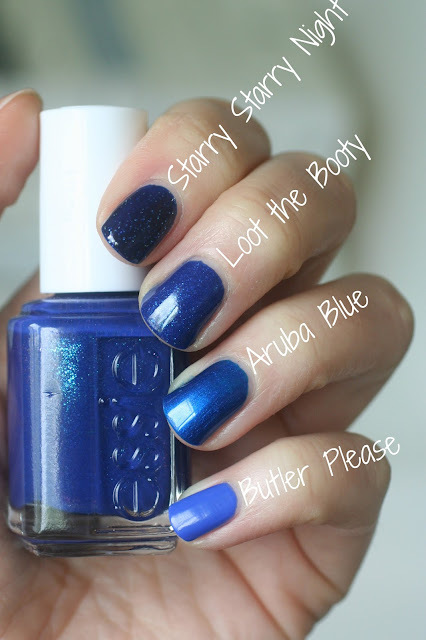 Aruba Blue is also a sapphire shade of blue but is a different tone than Loot the Booty. I've been asked a few times if I think you should buy Loot the Booty over Aruba Blue, but I love Aruba Blue so freakin' much! I'm very partial to it. I haven't bonded yet with Loot the Booty. It was the one polish I wanted in the whole collection and yet once I got it on my nails, I liked it but was a little less stoked. Maybe because the shimmer isn't as intense on the nail as it is in the bottle? So what do you think. Did any of these colours surprise you? Which ones will you be getting from the collection? Seems like the stars of this collection are Tribal Textiles and Viva Antigua, so if I pick up any, I may get those! Since I have Aruba Blue and Starry Starry Night, I think I'll skip Loot the Booty. Thanks for the awesome comparison! 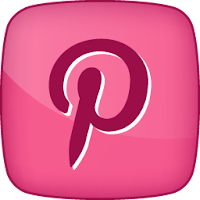 I always know what I need to add to my collection and what I can dupe thanks to you! Even though I have most of the similar colors, I will probably get Viva Antigua because I am a sucker for anything turquoise. Hi, I'm Monica, I really love sunset state of mind and butler please , heard b. Please is not a good formula. What was your experience with it? Thanks for this large comparison! I don't really like this summer collection as much as I liked the one from last year. You did so much work for us! Thank you! This is a great post. I had a chuckle when I read what you thought about Coconut Cove because to my eyes, I see a BIG difference between it and Blanc or Private Weekend. Maybe we perceive shades of white differently? It's possible, right? Since I got Coconut Cove I've loved it so much because to my eyes it's like no other white I own. Oh, and this is totally unrelated but, I think Aruba Blue looks just like Zoya Estelle which I love, I mean LOVE. I'd otherwise be dying to get Aruba Blue, but I love my Estelle plenty for now. THAT WAS THE BEST!!! 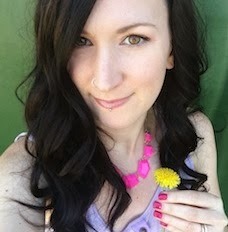 COMPARISON SWATCH POST EVER! Really. I enjoyed it so much, as a nail nerd, thats super informative here. You're totally right. The stars are definitely Tribal a Text-Styles and Viva Antigua! And this comparison made me want to bust out Color Binge and Sunshine State of mind and wear them too! 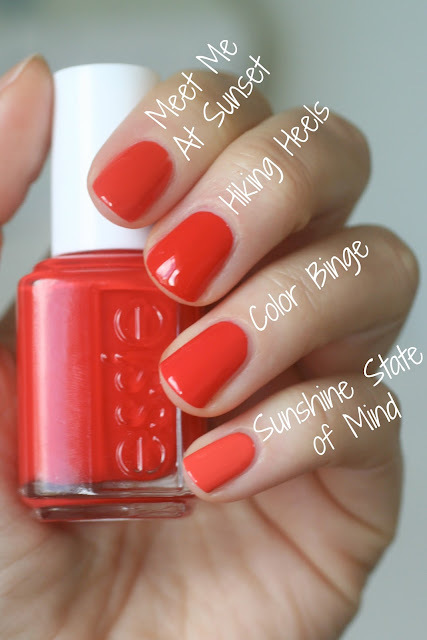 There's something about Sunshine State of Mind that is so wearable compared to other oranges. Hi Monica! I have a review of Butler Please on my blog if you type it into the search bar, but I didn't find it too bad! I thought it was going to be horrible but it was 2 fairly easy coats. Hi Chrissi! I'm with you, I didn't like the collection nearly as much as I liked last years. 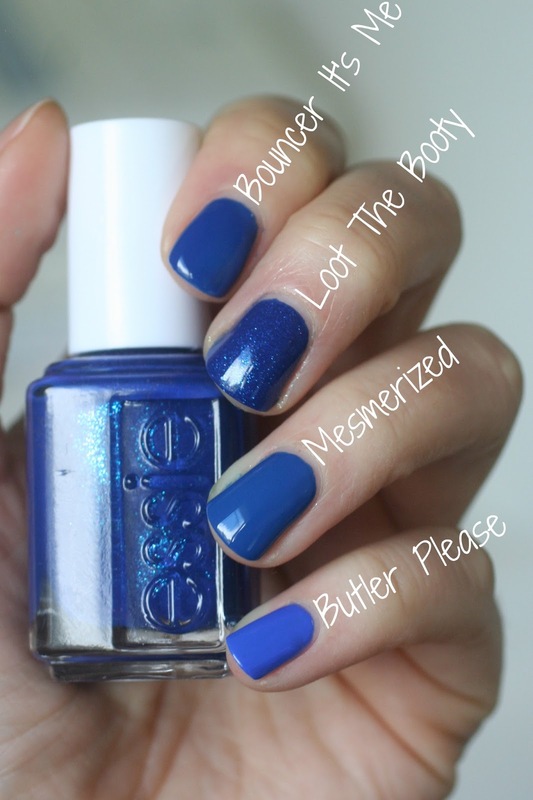 But it's nice to see Essie doing something a little different like those shimmers! I'm glad you liked the post! You know what's funny is that I have done comparisons before and the colour is so minisculey different and yet I'm still all over it and love it because "they are different!" I totally see what you mean about Coconut Cove ;) It IS different from Blanc. I don't know why it didn't wow me, because others seem to love it so much. Also, I know what you mean about turquoise! I actually have a turquoise piano in my dining room :). Interesting! Thanks for the info Carrie! Thank you Emma!!! Yes Butler Please is a good one to own because of that color! 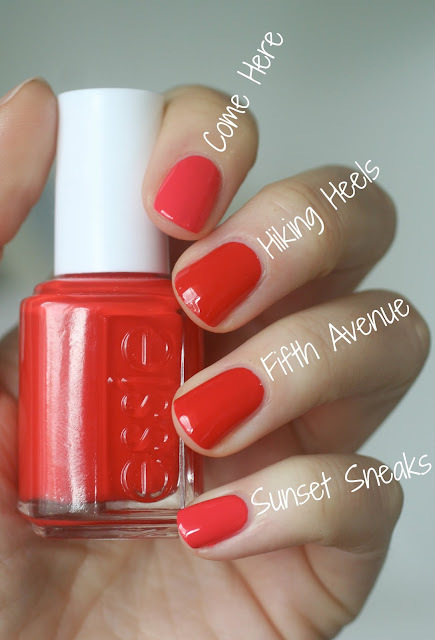 Looking for a good orange essie polish - i have yellow tone to skin and want to try - any suggestions? Thinking of Geranium? Hiking heels?